It wasn’t that long ago that Florida was the premier program in the conference, but in 2015 it feels like the Gators’ time in the sun has passed. Will Muschamp led Florida to an 11-2 record in his second season in 2012, but the Muschamp era was an otherwise forgettable one for Florida football. Now, the days of debating who Florida will meet in the SEC Championship game before the season even starts seem like a distant memory, and we are heading into a season with legitimate questions like: who’s more likely to make a bowl game Florida or Kentucky? With uncertainty and inexperience at the quarterback position, wide receiver Demarcus Robinson is going to be critical for the Florida passing game. Robinson is the only returning receiver to top 200 yards last season, and easily the most reliable target for either Will Grier or Treon Harris. Beyond Robinson, look for Ahmad Fulwood, Latroy Pittman, Jr., and slot receiver Brandon Powell to be the primary receiving options. 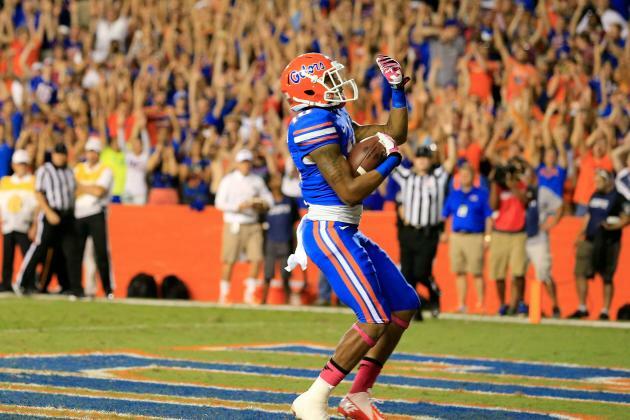 Florida has managed to maintain a decent ground game even in the “Dark Age of Offense” when Muschamp was at the helm. That should continue with Kelvin Taylor stepping into the full-time starter role, and freshman phenom Jordan Scarlett making an impact from day one. Taylor rushed for 565 yards and six touchdowns with no fumbles as the second back behind Matt Jones last season. 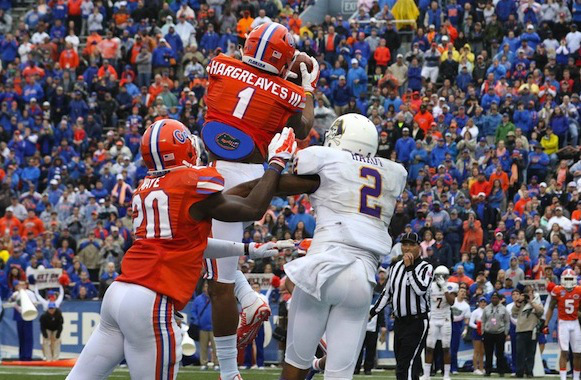 Now comes the real question that will shape the rest of Florida’s season: Grier or Harris? Honestly, Will Grier must be pretty awesome in practice for this to even be a debate. Treon Harris replaced Jeff Driskel about halfway through last season and promptly led the team to a win over rival Georgia. Harris never looked back and the Gators definitely improved with him at the helm, going 4-2 in their final six games. Treon didn’t exactly light the world on fire, but he made plays with his legs and gave Florida a significantly better chance to win than Driskel ever did. Unfortunately for Grier, Harris, Taylor, et al., they will be running/looking to throw behind four new starters on the offensive line, and Trip Thurman is the only member of the team with any starting experience other than Fordham transfer Mason Halter. I am intrigues to see what both starting tackles can do this season. Right tackle Martez Ivey is a true freshman, but if he’s as good as advertised then he can be a solid tackle from day one. David Sharpe is expected to start at left tackle as a sophomore. Vernon Hargreaves III and Brian Poole already make up potentially the best coverage duo in the conference, but when you add in super sophs Jalen Tabor and Quincy Wilson the Gators have a full quartet of solid cornerback play. Hargreaves and Poole combined for seven interceptions and 23 pass break-ups, while Tabor and Wilson added in two interceptions and eleven pass break-ups as freshmen. Throwing over the top of the Gator defense wasn’t any easier, either. Keanu Neal and Marcus Maye return at safety and pitched in four interceptions and nine pass break-ups in coverage and also forced a combined four fumbles. Dante Fowler moving on to the NFL leaves a pretty large hole for the remaining pass rushers to fill. Rush end Alex McCalister did have six sacks last season and Bryan Cox, Jr. had four, but no other returning member reached the three sack mark last season. Florida’s secondary is so good that they will be able to survive a sub-par pass rush, but that doesn’t mean that that’s ideal either. Jonathan Bullard does give the team a top-class run defender along the line at least. The former five-star recruit tallied 8.5 tackles for loss last season. 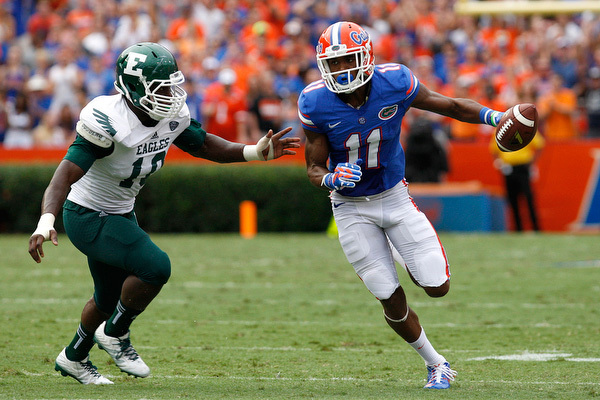 Another potential concern for the Gators is the all around play at linebacker. Middle linebacker Antonio Morrison is the lone proven player of this group. The senior had 65.5 tackles last season. However, no other returning linebacker topped twenty tackles. Florida managed to get to 7-5 last season, despite starting the season with walking interception Jeff Driskel at quarterback. No matter who plays quarterback for them this season it will be an improvement from what Driskel gave them, but unfortunately the other holes on offense may make life more difficult for the quarterback. The end of September will tell us a lot about what to expect from both Florida and their opponents. In week three the Gators travel to Lexington to take on the Wildcats in a game that could be the difference between bowl eligibility and just short for either team. The following week Florida hosts Tennessee where the Gators will put their streak of ten straight wins over the Vols on the line. October will also be an absolutely brutal month as the Gators have a home game against Ole Miss before traveling to Missouri and LSU in back-to-back weeks, then closing the month in Jacksonville against the Dawgs.